~ Search results - 38 products found! Complex spreadsheets and home-grown solutions just don’t cut it anymore - you need a solution that can give you comprehensive IP space visibility and help you prevent IP address conflicts from taking down network devices. SolarWinds IP Address Manager allows you and your team to ditch your spreadsheets for an easy-to-use, scalable and centralized IP address management solution. Plan, create, schedule, and share reports within an intuitive LUCID web interface—all while providing the controls you need. Agentless IT management & monitoring from any mobile device made easy! Mobile Admin from SolarWinds makes it easy to diagnose, triage & resolve IT issues in a few clicks from any smartphone or tablet. It supports all key IT infrastructure technologies – AD, VMware, Backup Exec, Exchange & more! Delivers real-time alerts and statuses on your Android, iOS, and Blackberry devices remote control with SSH, Telnet, VNC, RDP, proxy via Mobile Admin Server or direct connect. Easy to download & deploy, easy to use, & easy on your budget. Need a more streamlined way to manage your IT help desk and IT assets? SolarWinds® Web Help Desk™ software delivers an affordable, easy-to-use solution! In less than an hour after the download, you can begin to streamline ticketing, automate change management, simplify IT asset management, and build a searchable knowledge base that will decrease the demand on your support team. Download a free 30-day, fully-functional trial and see all of the great features Web Help Desk offers! Trusted by thousands of network engineers worldwide to simplify everyday network management tasks. Easy to set up and configure. Kiwi Syslog Server receives, logs, displays, and forwards syslog messages from network devices, such as routers, switches, Unix hosts, and other syslog-enabled devices. SolarWinds Log & Event Manager (LEM) delivers powerful Security Information and Event Management (SIEM) capabilities in a highly affordable, easy-to-deploy virtual appliance. It combines real-time log analysis, event correlation, and a groundbreaking approach to IT search to deliver the visibility, security, and control you need to overcome everyday IT challenges. SIEM software has never been easier to use or more affordable. SolarWinds User Device Tracker (UDT) makes it easy to instantly find a computer and retrieve the user name, switch name, port, port description, VLAN, and more. Simply search on a user name, IP address, Hostname, or MAC address and SolarWinds User Device Tracker will quickly find the current location of your device. And if the device is not currently connected to the network, historical data will show the last known location. You can even set up an alert that will notify you when the device connects—so you can be there waiting. Learn more or download a free fully functioning free 30-day trial. Storage Response Time Monitor makes keeping track of your storage response times and latency issues easier than ever! Now you can get at-a-glance insight into the host to datastore connections with the worst response times and the busiest VMs using those connections. See a breakdown of the datastore including type and device versus kernel latency. SolarWinds’ free Real-Time AppFlow Analyzer captures and analyzes Appflow, NetFlow, JFlow, and sFlow data in real time to show you exactly what types of traffic are on your network, where it's is coming from, and where it's going. Finally, you can diagnose traffic spikes and troubleshoot bandwidth issues. SolarWinds Application Performance Monitor (APM) delivers powerful monitoring, alerting, and reporting capabilities to applications and servers and at a price that won't draw unnecessary attention from your CFO. In less than an hour, APM can discover your applications and provide the visibility you need into the performance of your applications and the underlying operating systems and servers they run on. This cool tool gives you the ability to remotely install and enable SNMP on any windows server or workstation on your network. Save time when deploying applications requiring SNMP. Download SolarWinds latest free tool and simultaneously enable SNMP on multiple machines. Download SolarWinds FREE desktop tool and get a unified view of your IP address space. IP Address Tracker shows you which IP addresses are in use and which aren’t. It also eliminates manual errors associated with Excel spreadsheets and ensures IP addresses are listed in the right place. 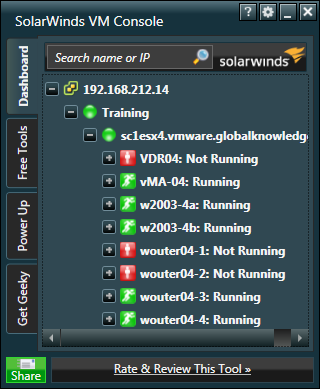 SolarWinds latest FREE tool lets you shut down & restart VMware machines without logging into vCenter or vSphere. It also gives you constant visibility into your VMware environment & up/down status of your VMware apps. Free VM Console Highlights include: Bounce VMs without logging into vCenter or vSphere, Get end-to-end visibility into your VMware environment—from vCenter through ESX hosts to VM guests, Track the real-time up/down status of your VMs from your desktop.